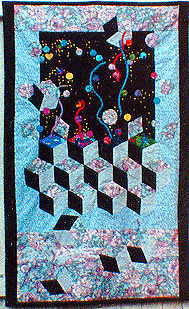 In 1991, I designed and made this quilted wallhanging for a challenge in Salt Lake City, Utah. A “challenge” is kind of competition. Usually it includes a rule that all participants must follow. That rule is designed to make the competition more interesting… or difficult. In many cases, the challenge element is a particular fabric, batting, or other major element. In this challenge, I had to use a certain fabric, and it had to appear in at least 20% of the finished quilt. The challenge fabric was the floral that appears in the Baby’s Blocks section, as well as bordering the top and bottom sections (not the actual border, which is black). I rarely use muted, tasteful florals in my work. I struggled to find a way to use the challenge fabric. Weeks passed and the deadline loomed, and nothing about that fabric inspired me. Then I realized that I could work in contrasts–meek with wild, traditional with jazzy. The finished wall hanging is 32″x52″, and at the time I called it, “Threads of the Past, Visions of the Future.” It is pieced and appliqued, with some stenciling (the small yellow dots) as a surface treatment. This quilt took top marks, winning an award for originality and design. Today I call it, “Baby’s Blocks, Gone Wild” and I’m eager to do more with contemporary twists and traditional designs.